Refill youself the ink cartridge Lexmark tricolor No. 27, with the next steps. The 27 tricolor Lexmark ink cartridges are ink cartridges of really good performance in comparison with their price, these ink cartridges are rated for about 160 pages when new and 150 pages after being refilled. As it can be seen there is not a big difference in quantity of pages since they have a very resistant sponge. These cartridges are compatible with i3 / X74 / X75 / X1100 / X1200 / X2200 / Z13 / Z23 / Z25 / Z33 / Z35 / Z500 / Z600 printers and can be refilled about 5 times still having the same quality. When buying these cartridges be sure to specify that they are Lexmark because there are also 27 HP Ink cartridges which you can see how to refill them. Place the cartridge in a place where ink spilling does not become a problem, it is recommended to use a piece of black fabric, fabric that is not going to be needed in the future. Normally these cartridges have two holes to be refilled under the lid located in the top of the ink cartridges, that is the only thing that complicates a little bit the refilling process since for doing so a knife or a blade will be needed to detach the lid. A little bit of silicone or just good quality glue will be needed to place the lid back again. Remove the lid on the top which serves to fix in the piece holding the cartridge inside the printer, you will see the ink cartridges colors and proceed to supply the corresponding ink in the corresponding color, you will need need about three syringes to provide ink to the cartridges. In each syringe you will need about 4ml of ink and with this amount of ink the cartridge will have a good rate and perform well when printing. The same syringe must not be used for all the colors. 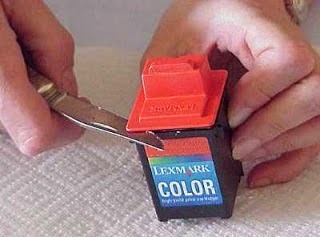 The combination of color when placing the ink cartridge with the connectors to the printer are the following. See combination of color, provide them in the same way, also you can look at the cartridge, you will be able to identify to what color corresponds each hole because it will have a small quantity of ink. Always provide ink to the cartridges as slow as possible, this case cannot be the exception, you have to do this process really slowly and with calm take all the time you can in this step, we advise the slowness so the sponge can be completely full. When completely refilling the cartridge in each color place the top lid again, it is recommended to set its position properly and use sturdy material to paste it as hot silicone or just masking tape. if you need to ask something contact us. After the refilling of the cartridges is finished several cleaning processes must be done with the printer, in case you do not know how to do them we advise to visit our test page, look how the colors should be and so you can determine if there is any problem with the cartridges, in case the color does not come out correctly clean the cartridges or try to unclog the ink cartridge.